is honored on Panel 7E, Line 124 of the Vietnam Veterans Memorial. 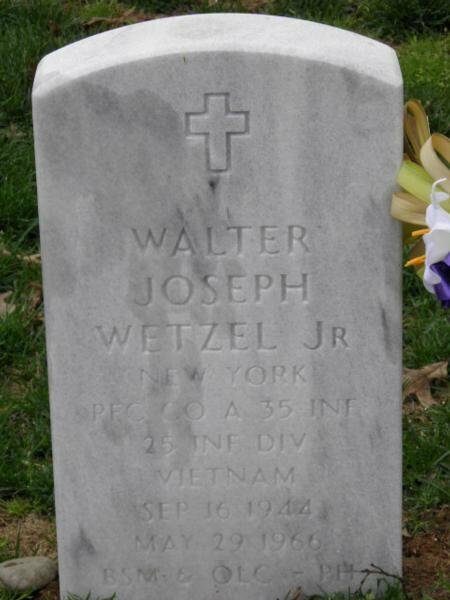 Private First Class Walter Joseph Wetzel Jr., Served with Company A, 1st Battalion, 35th Infantry Regiment, 25th Infantry Division, United States Army Vietnam. Joe sacrificed all to save his brothers. He dove onto a hand grenade so that his friends wouldn't be harmed. 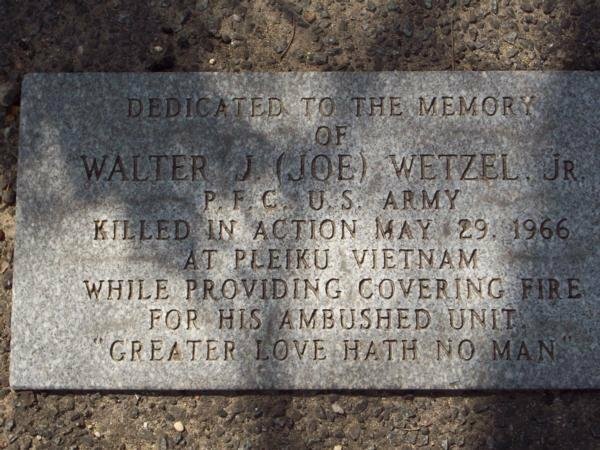 There is a memorial in Howard Beach, NY, that is the Wetzel Triangle. Dedicated to Joe. I grew up with stories of Joe and his short life. My dad was his first cousin. Joe was the "baby" cousin, being 7 years younger. I unfortunately never knew him. I was born in 1990. I was jogging by and I remembered the stories my family told about him. It seemed proper to stop and pay respects. Its a moving experience here, especially knowing we grew up in the same neighborhood and went to the same school. My thoughts and prayers go out to him and his family. Walter wasone of the nicest guy in our class...We were young and I remember him as a smart kid..always knew the work..Manners, kind and with a great smile. I remember him always, all through these many years..I honor his efferts to keep us all free..